The National Weather Service of Northern Indiana has issued a Winter Storm Watch for the entire 95.3 MNC listening area, which will begin at 10 p.m. on Friday, Jan. 18, and last until 10 p.m. on Saturday, Jan. 19. Snow accumulations of 4 to 7 inches is expected, beginning Friday night and lasting through late Saturday night. 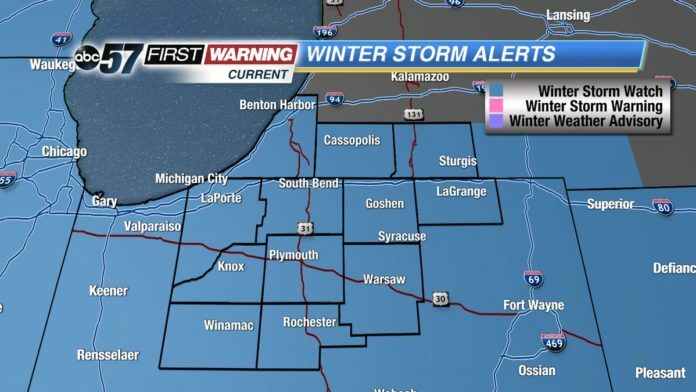 Once the storm has passed, Michiana will experience its coldest temperatures of the winter season, so far, with sub-zero wind chills Sunday night into Monday morning. For winter weather text alerts direct to your smart phone, text WEATHER to 45364 (msg & data rates apply). * WHEN...From Friday evening through Saturday evening. will create hazardous travel conditions. Thursday Afternoon: A 40 percent chance of snow. Cloudy, with a high near 33. Southeast wind around 5 mph becoming calm. Thursday Night: A slight chance of snow and freezing drizzle before 10pm, then a slight chance of freezing drizzle. Cloudy, with a low around 27. West wind around 5 mph. Chance of precipitation is 20%. Friday: Cloudy, with a high near 31. Northwest wind around 5 mph becoming north in the afternoon. Friday Night: Snow, mainly after 10pm. Low around 22. East wind 5 to 15 mph. Chance of precipitation is 80%. New snow accumulation of 1 to 3 inches possible. Saturday: Snow. High near 25. Northeast wind around 15 mph, with gusts as high as 25 mph. Chance of precipitation is 90%. New snow accumulation of 2 to 4 inches possible. Saturday Night: Mostly cloudy, with a low around 8. Sunday: Partly sunny and cold, with a high near 15. Sunday Night: Mostly cloudy, with a low around -1. M.L.King Day: A 30 percent chance of snow after 1pm. Partly sunny and cold, with a high near 14. Monday Night: Mostly cloudy, with a low around 10. Tuesday: A 50 percent chance of snow. Mostly cloudy, with a high near 31. Tuesday Night: Snow likely. Mostly cloudy, with a low around 19. Chance of precipitation is 60%. Wednesday: A chance of snow. Mostly cloudy, with a high near 27. Forecast remains mostly unchanged, confidence continues to grow.